← Power User Profile: Zyp! I guess for Samson, that really does qualify as a plan. Well, Mick, you’ve broken the fourth wall and found the Loop ad infinitum. Just avoid dividing by zero and everything will return to normal. OR WILL IT? I love the look of absolute pleasure on Samson. I always figured he would trash a building if it happened to be where he ended up, but he actually plans it out. Luck? Samson don’t need no stinking luck! Buildings tremble before his approach, knowing they ain’t gonna last through his visit. 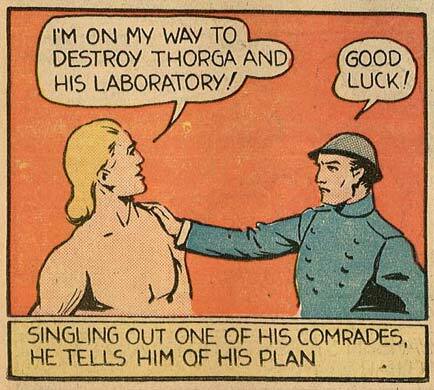 Yes, blast that Thorga for producing a depilatory cream! He must be stopped before someone thinks of using it on my head. Again, what does this guy have against buildings anyway!!! Why is he a Jewish hero and has the aryan blond hair, i just don’t get it! Well, he is just the descendent of the Biblical Samson. Possibly that’s the only Jewish ancestor he’s got.